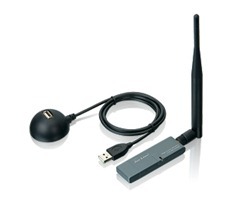 AirLive WL-1600USB is a High Power 802.11g USB Adapter with detachable antenna. It is designed to allow your PC to reach the longest distance possible. With transmission power of 20dBm, WL-1600USB offers long distance wireless coverage. By using 5dBi antenna which is included in WL-1600USB, it can reach up to 22Mbps in normal indoor usage.